Produced by our ACS/CUNY Informal Family Child Care project, this periodic newsletter provides information and activities specifically aimed at the work of family child care providers. The best gift you can give children is your time and attention. Each time you interact with children you are connecting in a new way and become a more sensitive and responsive caregiver. With the plethora of holidays and cultural celebrations throughout the year, it can be challenging to know how to explore and recognize these themes with children. While there are many resources available to caregivers and families, they are not equally relevant and appropriate for all children, and often reinforce images and representations of people and places we may not ourselves understand or be comfortable with. School's out and the long days of summer are upon us. Children love the hot summer months because they provide opportunities to explore, spend time outdoors and play. Here are some things to keep in mind when you're planning your summer, as well as some easy ideas that will keep children entertained throughout the summer. Children are spending more time with screen media – and at younger ages – than ever before. Devices, apps and games designed for children – and marketed to eager families and caregivers – are seemingly endless. Electronic “entertainment” in its many forms comes packaged for children, including infants and young children; and, many children learn to master digital devices before they can talk, tie their shoes or read. Nearly a quarter century ago, the Autism Society launched a nationwide effort to promote autism awareness, inclusion and selfdetermination for all, and assure that each person with Autism Spectrum Disorder (ASD) is provided the opportunity to achieve the highest possible quality of life. National Autism Awareness Month represents an excellent opportunity to promote autism awareness, autism acceptance and to draw attention to the tens of thousands facing an autism diagnosis each year. All children show behaviors that were once thought of as typical for the opposite gender – there are no exclusively male or female traits, so this is normal. Children need to feel comfortable with, and good about themselves. Each child has her/his own strengths which can and should be a source of current and future success. Understanding gender identity as a developmental stage in young children. Ideas to explore different gender roles and styles of play among young children. Self-Care Corner: The power hour! February is Black History Month. Now what?! All children are curious about how language works. From the time they are born they begin to assign meaning to and communicate with their environment. The growth of language and literacy skills is a vital part of a child’s overall development. Hello and Happy New Year! We are pleased to share the January 2016 edition of the ACS/CUNY Informal Family Child Care Project's monthly e-newsletter Connections in Early Learning! Self Care Corner: Take Action! Hello! We are pleased to share the December edition of the ACS/CUNY Informal Family Child Care Project’s (IFCC) monthly e-newsletter Connections in Early Learning! In this newsletter you will find information and resources to support the important work you do with children and families every day. Children are born ready to learn and are naturally curious. They learn about their world through everyday interactions and experiences. Play is one of these experiences and is essential to early learning. Hello! Welcome to the first edition of the ACS/CUNY Informal Family Child Care Project monthly e-newsletter Connections in Early Learning! Hopefully you are off to a good start this school year! This newsletter will share information and resources with you monthly to support the important work you do with children and families every day. Whether children have been with you, are returning from last year, or are new to your care, preparing your program to receive children is important and should be done thoughtfully and intentionally. A welcoming, well-planned environment makes it easier for children to develop and learn, and makes things simpler for families and for you! Spring is a time for renewal. Time to shake off the cold, reflect and recharge our bodies, minds and spirits. During winter we tend to eat more, move less and are more vulnerable to the blues, the sniffles and low energy. Taking care of ourselves and children is crucial for our overall health and wellness. This edition of Connections in Early Learning has great information and resources for keeping you and the children you care for healthy and well. It also contains wellness tips and tools, opportunities to get out and about, and simple activities you can do to nurture young children’s curiosity and development. 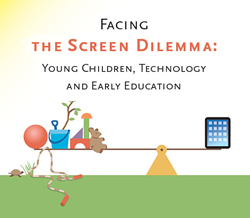 In 2012 the Campaign for a Commercial Free Childhood, the Alliance for Childhood and Teachers Resisting Unhealthy Children's Entertainment published a guide entitled Facing the Screen Dilemma: Young Children, Technology and Early Education. The guide provides an overview of research on screen time and young children, and offers guidance for early childhood educators, programs and families around if and how to incorporate technology in child care settings and homes. "Smart boards. Smartphones. Tablets. E-books, and more. The rapid influx of new screen devices poses a special challenge for the early childhood community. A child born today will experience wondrous technologies few of us can even imagine. How do we best support children's growth, development, and learning in a world radically changed by technology? Arriving at a truly child-centered answer to these questions is complicated by several factors. The new technologies are exciting and often equated with progress. They are evolving so quickly that our grasp of how to make and operate them has rapidly outpaced our understanding of the educational, developmental, ethical, and social ramifications of their design and use." 29% of babies under 1 year watch TV and videos for an average of 90 minutes. 64% of children 12-24 months watch TV and videos averaging just over 2 hours. Preschoolers spend as much as 4.1 to 4.6 hours per day with screen media. The more time our youngest children spend with screens, the less time they spend interacting with caring adults and in hands-on, creative play—2 activities proven to be important for learning. Too much screen time is linked to learning, attention, and social problems, childhood obesity and sleep disturbances. It also exposes kids to lots of harmful advertising. Screen media can be habit-forming. Young children who spend more time with screens have a harder time turning them off when they get older. Even a little exposure to violent, sexualized, stereotyped, or commercialized content can be harmful to children. Make intentional decisions about technology. Choosing to be screen-free is a viable option. Whether or not you use technology in your setting, learn how technology can affect children's development and learning, and take this into account in your work with them. Make sure that children have plenty of time for hands-on, creative and active play. They also often love helping with everyday activities, including gardening, baking, and folding laundry. If you choose to use screens with your children, set rules early on about when, where, what, and how much. Screen activities with obvious end-points can help a lot with time limits. Remove televisions and other devices from children's bedrooms. Turn off screens when they are not in use. Parents talk less to children when background television is on and it interrupts the kind of play essential for learning. Spring has sprung and the cold winter months are finally over! Let's go outside! With such busy lives, spending time outside can seem like a luxury. However, there are many indications that time outdoors is important to the overall health of children as well as adults. Children learn from everything around them. The way you set up your child care environment has a significant impact on children's learning and behavior and your ability to do your job. Our latest issue of our newsletter for family child care providers discusses the impact of provider interactions with children, and how being intentional to make the most of these interactions. The very first issue of our exciting new newsletter specifically designed to help family child care providers improve their practice.